Although Avery, MacLeod, and McCarty showed in 1944 that nucleic acid was both necessary and sufficient for the transfer of bacterial genetic traits, protein was still suspected to be a critical component of viral heredity. Alfred Hershey and Martha Chase showed that this hypothesis was incorrect with a simple experiment involving the use of a food blender. The Hershey-Chase conclusion has since been upheld numerous times*, the most recent by a modern-day experiment using real-time fluorescence. Hershey and Chase made preparations of the tailed bacteriophage T2 with the viral proteins labeled with radioactive sulfur, and the nucleic acids labeled with radioactive phosphorus. The virions were added to a bacterial host, and after a short period of time were sheared from the cell surface by agitation in a blender. After this treatment, the radioactive phosphorus, but not the radioactive sulfur, remained associated with bacterial cells. These infected cells went on to produce new virus particles, showing that DNA contained all the information needed to produce a bacteriophage. In a modern validation of the Hershey-Chase experiment, bacteriophages are mixed with a cyanine dye which binds to the viral DNA (illustrated). 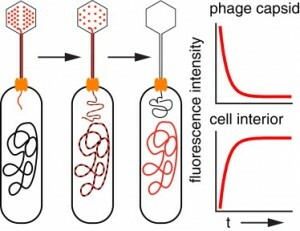 Upon infection of the bacterial host, the phage DNA is injected into the cell together with the dye. In time the dye leaves the phage DNA and binds to the host genome. This process can be observed in real-time (as it happens) by fluorescence microscopy. This technique was used to visualize single bacteriophages infecting an E. coli host cell. It takes about 5 minutes on average for 80% of bacteriophage lambda DNA to exit the capsid, with a range of 1-20 minutes. These experiments do not simply provide a visual counterpart to the Hershey-Chase conclusion, but reveal additional insights into how viral DNA leaves the capsid. One interesting observation is that the amount of DNA that remains in the capsid apparently is not the sole determinant of how quickly ejection occurs. The amount of DNA ejected from the capsid does appear to regulate the dynamics of the process. The kitchen blender experiment contrasts vividly with the complexity of real-time fluorescent imaging. Hershey and Chase did not have the technology to visualize phage DNA entering the host cell; they used what was available to them at the time. While improved technology is important for pushing research forward, simple experiments will always make important contributions to our understanding of science. *The infectivity of cloned viral DNA is one validation of the Hershey-Chase experiment. Hershey, AD, Chase, M. 1952. Independent functions of viral protein and nucleic acid in growth of bacteriophage. J. Gen. Physiol. 36:39-56. Van Valen, D., Wu, D., Chen, Y-J, Tuson, H, Wiggins, P, Phillips, R. 2012. A single-molecule Hershey-Chase experiment. Current Biol 22:1339-1343. This is an extremely clever adaptation of reasonably simple techniques – and I love it that it throws light back onto the Hershey-Chase experiment from so long ago. As part of trying to humanise microbiology, I used to relate to my students how Hershey had used a blender intended for the home – but that the success of the experiment meant that Mrs Hershey never got her blender. And I WISH I could remember where I read that…!